Space Camp 2019 is underway in Year 5 and 6. Today, we have organised our crews based on the skills of individuals and designed mission patches. Mission 1 and 2 successfully completed! 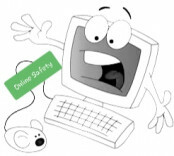 Tuesday 5th of February we will be holding a parental workshop for online safety. It will run from 2.15pm till 3.15pm. Year 2 pupils spent the day in Gilwern ‘outback’ building dens, creating Australian themed nature art and cooking our own Bush Tucker food. Digital Leaders launched Safer Internet Day 2019 by holding our school assembly. Our main message is to be SMART when communicating online. Keep an eye out on our school twitter feed and gallery for more photographs. School closed - Due to treacherous icy conditions the decision has been made to close today. The safety of students parents and staff is paramount.